Thin, stylish and practical, the best Razer laptop for gaming is here to replace your existing notebook and desktop alike. Pinpointing the best Razer laptop for gaming in 2019 is no effortless undertaking. In the time that's elapsed since the debut of the first Razer Blade back in 2011, the gaming laptop market as a whole has undergone a great deal of change. 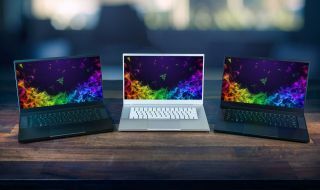 Whereas the original Razer Blade was something of a unicorn for its ultra-thin chassis, the widespread success of Nvidia's Max-Q initiative means featherweight and razor-thin (no pun intended) are the new norm for gaming laptops. No longer is it necessary to decide between buying an ultrabook and shelling out for the best gaming laptop since, today, they're almost at a point of concurrency. That said, in 2019, the best Razer laptop for gaming is still among the top contenders in its class. Slim, light and powerful, the best Razer laptop for gaming right now is the Razer Blade 15, a Max-Q notebook whose narrow, 0.68-inch profile rivals that of the 15-inch MacBook Pro. But because I couldn't definitively crown a winner without dredging up a handful of honorable mentions, I've tested and recapped the Razer Blade Stealth 13 and the Razer Blade Pro 17 for your consideration as well. Whether you want the best Razer laptop for gaming or the next closest thing, keep reading. If it weren't for the initially prohibitive asking price (and the fact that the confirmed 4K model wasn't available), I would have bought a Razer Blade 15 on day one. Yet, in retrospect, it's a good thing I didn't because the laptop formerly known as the "world's smallest gaming laptop" is finally shaping up to be the best Razer laptop for gaming the company has ever made. Today it comes in a variety of flavors, ranging from the affordable GTX 1060 base model to the incredible RTX 2080 "Advanced Model" whose profile is even leaner at 0.7 inches thin. At the same time, it weighs fewer than five pounds, making it the perfect travel companion. In order to achieve such a feat, unfortunate concessions were made. Ethernet, for example, is nowhere in sight, so playing games on a wired connection requires shelling out for one of those maligned USB-C adapters. Though the arrow keys on the keyboard are a little out of place as well, these are minor flaws I can overlook. Otherwise, the Razer Blade 15 is a contemporary example of how to do gaming laptops right. Rivaling the MacBook Pro in its size, while simultaneously giving it a run for its money in terms of performance—not to mention keyboard reliability and comfort— the Razer Blade 15 is hands down the best in it class. When I reviewed the 5th-generation Razer Blade Stealth earlier this year, I lamented its disappointing gaming performance. It was, after all, pitched to me as a "gaming ultrabook." As a regular ultrabook capable of light gaming on the side, however, it's one of the best. Sold with or without discrete Nvidia GeForce MX150 graphics, the Razer Blade Stealth is the best Razer laptop for gaming on a budget. Granted, there aren't a whole lot of options. For the price, you could buy a beefier, high performance PC adorned with all the latest bells of whistles. But then you'd be missing the point. At 0.6 inches thin and around three pounds light, the Razer Blade Stealth 13 is meant to be carried around, either for work or for play. Its six-plus hour battery life bodes well for its endurance. Its small, 4.5" x 1.5" x 1" USB-C power brick is a shining example of how little space a charging cable should occupy in your bag. And despite the low frame rates it produces in massive triple-A blockbusters, it is ideal for indie games and esports with simple graphics that don't necessitate fancy graphics solutions. All told, the Razer Blade Stealth is a first-rate ultrabook that does some gaming, even if it's not at 60fps all the time. Admittedly, the Razer Blade Pro 17 is due for an upgrade. What was impressive two years ago when it was last refreshed is now getting long in the tooth. Still, it's worth noting that it's the only 17-inch laptop Razer currently sells, making it the obvious pick for gaming on a big screen. It's also one of the last remaining Razer Blade models you can buy with an IGZO display, which consumes less power than its IPS alternative, a nifty inclusion given the nature of the power-hungry Nvidia GeForce GTX 1080 found inside its gorgeous shell. Speaking of which, its design might be antiquated, but when it first launched, the Razer Blade Pro 17 was so ahead of its time that it certainly doesn't look as old as it could. Its bezels are beefy, yes, but its tucking of a full-blown mechanical keyboard inside a slender 0.88-inch frame is an achievement worthy of praise. To this day, it's one of the few gaming laptops on the market to attempt such an undertaking, much less pull it off. Better yet, it tried something new with the touchpad, too, as its "starboard" touchpad placement and accompanying scroll wheel are innovative enough to warrant a sequel. Until then, the Razer Blade Pro 17 is your best bet.